Anyone who pays attention to Internet sidebars can tell you there are many ways to rank the 50 states: the strength of their economies, quality of life, business climates, or legal environments, to name a few. And while some rankings may be designed as fodder for Internet “clickbait,” ideally they inform us about the best places to live, locate, and do business. 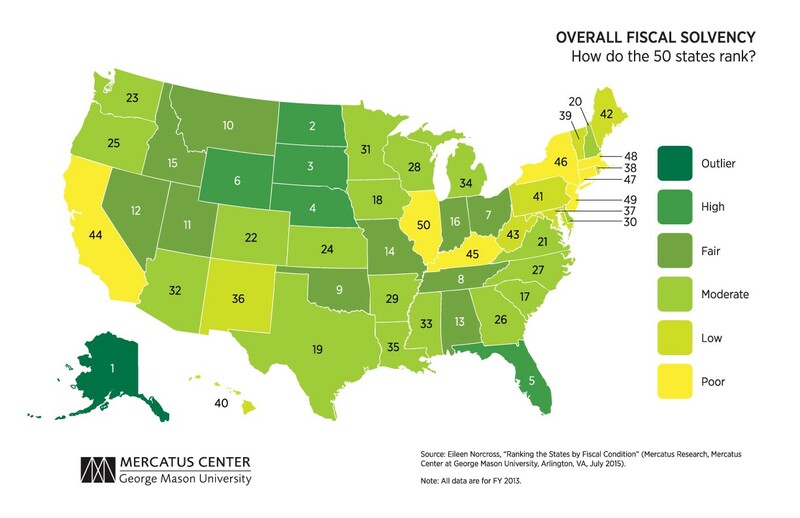 Until relatively recently, we didn’t have a reliable way to rank states’ fiscal health using basic financial metrics, because each state reported its numbers differently. Now, with over a decade of standardized and audited Comprehensive Annual Financial Reports (CAFRs) on state websites, it is possible. Many local governments use a similar approach as an early warning system to identify serious financial issues before they become a threat. Using the most up-to-date information available (FY2013 CAFRs), I ranked the states’ overall fiscal health based on five universal criteria: short-term, long-term, and fiscal year budget solvency, “fiscal slack,” and debt (including pension and health care liabilities). This is about more than balance sheets. State economies and business climates depend partly on how governments handle their finances and your tax dollars. Poor spending, budget or tax policies may signal that a state is a poor destination to open a business, raise a family, or retire. And as we’ve seen in recent headlines, when states underfund their pensions, it puts pressure on spending in other areas, such as schools, transportation, and health care. The bottom performers should come as no surprise: New York (46), Connecticut (47), Massachusetts (48), New Jersey (49) and Illinois (50) did poorly across the board. Little cash on hand to cover short-term bills, difficulty balancing budgets, unsustainable long-term expenses and an astonishing level of unfunded pension liabilities left them with painful political and policy decisions to make. All of these states have also issued bonds to cover pension payments, in some cases significantly increasing debt. For New Jersey and Illinois in particular, it’s not likely to get any better any time soon. The recent Illinois Supreme Court decision to overturn modest pension reform means Illinois must figure out how to pay for a $200 billion unfunded pension liability in the coming years. New Jersey finds itself in a similar place, with part of its 2011 pension reforms recently ruled unconstitutional. Other states should take note. Pensions are a problem nearly everywhere. Years of muddled government accounting has led states to underpay worker pensions in hopes that strong investment returns will bail them out. States that report flush pension plans do so by ignoring investment risk. This accounting mishap has serious implications for their economies and business climates. The top performers, Alaska (1), North Dakota (2), South Dakota (3), Nebraska (4) and Florida (5), also share a few things in common. These states had cash on hand to cover short-term spending, yearly revenues that exceeded spending, low levels of debt, and relatively small levels of non-pension benefits—known as Other Post Employment Benefits. The top three states owe their fiscal largesse to a dependency on oil, gas and natural resources revenue. In some years, this produces a windfall, but it can also lead to increased spending and the potential for sudden shocks. When oil prices fall, so do revenues, leading to budget shortfalls. Consider Alaska’s budget gap this past year. While the state ended its expensive defined-benefit pension plan in 2005, the remaining liability for the old plan is large. A lot of cash and strong revenues shouldn’t lead legislators to forget about a big pension liability. Two other top states, Nebraska and Florida, boasted low levels of debt and high levels of cash and budgetary solvency, making them among the best fiscal performers in the country. It’s good to keep in mind that while there are clear top and bottom performers, rankings are relative. The C students might set the curve in a class full of Ds and Fs, or bring up the rear in a class full of honor students. Even some of the top states have their issues. The real lesson here is that accurate financial reporting should matter to more than just accountants. It affects us all. — Eileen Norcross is a senior research fellow with the Mercatus Center at George Mason University and program director for its State and Local Policy Project. She is the author of a new study ranking the 50 states’ fiscal conditions.